The editors of Stanford Daily have criticized the less-than-civil questioning by "enraged Indian nationalist" after President Musharraf's speech at Stanford University last Friday. The Stanford student body clearly did not present itself well. Instead of engaging in a healthy intellectual and political discourse worthy of Stanford, they brought dishonor upon a highly regarded international institution of higher learning. The session was characterized by catcalls and vicious attacks on Musharraf when "enraged Indian nationalists and other emotionally charged students questioned everything from the legitimacy of Musharraf’s rule to the inherent corruption of the Pakistani government". The response was "equally defiant" from "finger-wagging" Musharraf. In the end, the session "contributed little to the debate" and created "an intellectually stifling atmosphere for those hoping to foster authentic debate". In spite of my best efforts, I was unable to get an admission ticket to the event. It seems that the less-than-transparent ticket allocation process at Stanford allowed the extreme Hindu Nationalists at Stanford to pack the audience and degenerate the expected civil discourse into a vulgar assault on Musharraf, and Pakistan by proxy. From the reported content of comments and the tone of the questions, it seems that many of these aggressive and uncivil attendees are probably affiliated with the Sangh Parivar considered responsible for massacres of minorities in Gujarat and Orissa. 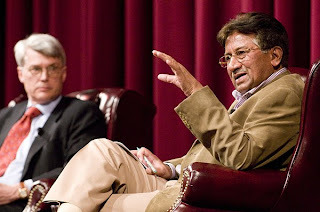 This past Friday at Memorial Auditorium, the ASSU Speaker’s Bureau and Stanford in Government — in conjunction with a host of other campus organizations — presented Pervez Musharraf, the former Pakistani head of state, for their annual “Big Speaker” series. Following his contested rise to presidency in 2001, Musharraf played a central role in global counter-terrorism efforts and Indian-Pakistani relations, at the same time drawing controversy in international politics. After delivering a nearly 55-minute speech that highlighted the importance of combating terrorism, resolving political strife in the Middle East and South Asia and other issues, Musharraf faced a question-and-answer session with the Stanford community. No sooner had the microphones been turned on did the cat-calls start flying. Enraged Indian nationalists and other emotionally charged students questioned everything from the legitimacy of Musharraf’s rule to the inherent corruption of the Pakistani government. The end result was ultimately a back-and-forth between strong-willed, would-be inquisitors and an equally defiant, finger-wagging Musharraf. This event is but the most recent manifestation of the problem with enlightened and civil discourse on campus. As one of the leading educational institutions worldwide, Stanford is a repository for diverse opinions, ideologies and global outlooks. Oftentimes, as evidenced by the Musharraf question-and-answer session, these beliefs conflict in less-than-subtle ways. As far removed as the Farm seems from events in the real world, too often do issues of national and global import trickle down into fiery dorm list exchanges. The recent strife in Gaza has highlighted the uneasy relationship between Israeli- and Palestinian-leaning student organizations on campus. The 2008 election cycle deeply shook the psyche of student life, from the accusations of viciousness in the Democratic primaries to the outrage over the passage of Prop. 8. Many hold particularly strong beliefs on these issues, yet the climate has not always been conducive to certain parts of the population effectively articulating positions not shared by a majority of the student body. The editorial board in no way advocates the curtailing of dissent or an environment that values diluted, politically correct tripe as a means to address complex issues. Rather, in coordination with the educational mission of this university, we endorse a campus culture that provides for the free and civil exchange of varied beliefs in a non-threatening setting that encourages intellectual stimulation and growth. Too often do we find tumultuous subjects reduced to shouting matches, in which each side tries to drown out the other in a sea of impassioned remarks. This does little to perpetuate an atmosphere in which disagreement is celebrated. The University is often held up as a central place where personal beliefs are challenged and redefined, where exposure to diverse ways of thinking expands one’s perspective. It is thus ironic that many students interested in civil discussion may shy away from thorny topics for fear of instigating conflict in the dining hall, on the chat list or in emails to The Daily. Shouting matches, electronic or otherwise, not only contribute little to debate but also create an intellectually stifling atmosphere for those hoping to foster authentic debate. Musharraf is no doubt an immensely controversial figure, and his presence should have rightfully sparked an intense and thoughtful discussion on the state of South-Asian geo-politics and the current state of counter-terrorism. Just as the Gaza conflict and the presidential election have brought opposite ideologies to a head, we should not balk at the prospect of lively debate. If we prize our reputation as a world-class institution, it is incumbent upon us a student body to argue for our beliefs, but in a way that is more in line with the values of Stanford and less comparable to cable television news stations. This is pathetic! What else could be expected of these fanatic Hindus. These extreme Indian nationalist have so such low self esteem only way to feel good themselves is good old Pakistan bashing. More disturbing is they are using school like Stanford to promote exclusive hate philosophies that promote violence. This is the natural outcome of degrading the Pakistanis within their own country. Remember how much one Pakistani has to face to get a legitimate visa for so called freedom lover countries. I was there at the event. Your article seems to go overboard on the 'friction' between students and Musharraf. Out of about 15 questions asked there were about 3 from Indian nationals. The very first Hindu Nationalist person made more of a statement than a question, and Prof. Sagan kept on asking if there is a question or just a statement. The other two questions were about painting Pakistan as a terrorist state by the Hindu Nationalist. As a Pakistani, Musharraf made us proud. He did not loose his cool. He was not fingerpointing. His approach was calm and rational. He was espousing a forward thinking approach. To the audience it made the Hindu nationalist come across as the terrorist they are. And Musharraf painted a picture of Pakistanis that improved their image from gun toting terrorists. Musharraf also raised the point of the burning of 61 Pakistanis on Sumjhota Express, which has largely gone un-reported. This was the train of Pakistanis coming from Delhi to Lahore, that was fire bombed by an Indian army Colnel. In all a great event. You say, Nowhere in the article does it say "Hindu Nationalist." I quote from the article - "Enraged Indian nationalists and other emotionally charged students questioned everything from the legitimacy of Musharraf’s rule". "Indian Nationalism" was a movement in the 30s, 40s and early 50s that included many prominent Muslims, Sikhs, and Untouchables. In today's Indian political spectrum, there is no such thing as "Indian Nationalism". It died with Gandhi and Nehru. For the last three decades, it has been a contest between Hindu Nationalists ( aka BJP and its affiliates) on the right and all others who do not describe themselves as "Indian Nationalists". You say, "Your article seems to go overboard on the 'friction' between students and Musharraf." As I said, I wasn't able to be there, although I tried. My post is based on reports from Stanford News Service and Stanford Daily, both of whom are critical of the attending students' behavior, specifically mentioning Indian students as the offenders. I am glad hear from you that Musharraf handled himself well in the face of provocation. May be it's a matter of cultural differences as regards the limits of civil behavior that seem to "shock" the non-South-Asian audience there. a 'Big Speaker' at Stanford University today. terrorism involved keeping a strong military "because that's the language these elements understand", but also alleviate poverty and educate people, and solve long simmering political conflicts. situation got so bad that he was forced to declare emergency. Afghanistan released from the US custody. demanded extradition of the people responsible for that act of terror. The attitude and behavior of India's middle class (that includes Indian students on US campuses) is summed up well by an India writer Pankaj Mishra. As a Stanford student who has lived in Pakistan and is currently researching the psychological and political roots of terrorism under Prof. Robert Sapolsky, I feel compelled to point out disagreements between Musharraf’s explanations for terrorism and the academic literature on the subject. And despite the many well-intentioned propositions Musharraf gave on Friday, it is important to expose the blatant hypocrisy of such claims with his own political record. Throughout his talk, Musharraf consistently emphasized that the root of terrorism lies in illiteracy and poverty. And while illiteracy and poverty may certainly contribute to terrorism, an explanation based on these factors alone offers an over-simplification of the terrorist phenomenon. A more appropriate account of terrorism stems from understanding it as violent form of political protest, and not an ideology that uneducated people are “brainwashed” into. In general, the victims of poverty are too busy figuring out how to get by from day to day to act upon any indignation they may harbor as a result of their socio-economic predicaments. According to a wealth of political literature, it is actually the elite who have driven political uprisings in the past given their increased access to resources, time and ability to strategically analyze socio-economic injustices. Indeed, the leadership of groups such as the Revolutionary Armed Forces of Colombia (FARC), Hamas, Irgun and Weatherman consisted of highly educated and wealthy individuals. The same is true of the masterminds and perpetrators of the 9/11 attacks, Madrid train bombings and London subway bombings. Surprisingly, Musharraf acknowledged this phenomenon in his speech as well, but failed to elaborate on the inherent contradiction such a fact poses to his “illiteracy/poverty” argument. Bilaal Mahmood makes reasonable arguments in a civil manner that will likely contribute to a better understanding of the causes of terror. The issue I have with the Indian students is one of basic attitude and civility. As I said earlier, Regardless of Musharraf's or any Pakistani leader's virtues or flaws, the attitude and behavior of India's middle class (that includes Indian students on US campuses) is summed up well by an Indian writer Pankaj Mishra. The preceding words were written by Pankaj Mishra and published in the Guardian newspaper. You can find an exact copy of Bilaal Mahmood's views on my blog here. Thank god that Pakistan has citizens such as Bilaal. The hope for the subcontinent lies in people like these. Not in people who sing paeans to a military dictator who specializes in military coups and wars of aggression. And about trying to paint Indian nationalists as Hindu nationalists, good try Riaz. I can return the favour by painting all Pakistani nationalists as fundamentalist Islamists (which seems closer to the truth in the Islamic republic). But I won't do that. I would just rebuff your claim by one word "Abdul Kalaam". You said "For the last three decades, it has been a contest between Hindu Nationalists ( aka BJP and its affiliates) on the right and all others who do not describe themselves as "Indian Nationalists"." What is nationalism? Here is the definition from wikipedia - "Nationalism can refer to an ideology, a sentiment, a form of culture, or a social movement that focuses on the nation" Actually " Indian nationalists" is precisely what the Congress and other secular parties want themselves to be perceived, in contrast to "Hindu nationalists." You are deliberately trying to put a new convoluted spin to a term which the Stanford Editorial uses to simply convey people who are fiercely patriotic. You also gleefully indulge in the logical fallacy of taking another person's opinion and applying it as the holy grail of truth about a community's "attitude and behaviour", in a completely different context. To realize the absurdity of your argument, during the war in Iraq, Bush's approval ratings saw a dramatic spurt - see http://www.hist.umn.edu/~ruggles/Approval.htm . Does this mean to say all American students at the time did not exhibit "basic civility", as you put it? You quote one Pakistani student (Congrats, you found one at Stanford!) and make a statement about the "attitude" of Indian students on US campuses. Let me quote from one Indian's blog at http://www.saketvora.com/ - "The first question to Musharraf was asked by an Indian Kiwi i know, and began with a series of damning allegations, in the vein of “Given that you illegal seized power, given that you suspended the Constitution twice, given that you banned free expression, given that…….how do you expect us to believe anything you’ve said?”. An applause was started (as were a few boos)". He concludes with "All in all, I’m still glad Musharraf came to campus and that I attended. I don’t particularly like the guy or think he’s done a stellar job, but I appreciate the chance to see and hear him"
I agree with your sentiments that "Thank god that Pakistan has citizens such as Bilaal." As to your point about equating Hindu Nationalists in India with Islamic Fundamentalists in Pakistan, let me just say that Hindu Nationalists win elections and get majorities in India (that tells you how popular their evil ideology is, particularly among the urban middle class ), Islamic Fundamentalists never go beyond single digits in Pakistan. what an awesome intellectual reply I really enjoyed it Mr Riaz Iam impressed with your logic, to Mr Ray L, you definately need to be a paid advisor to Pakistani primeminister. Here's my response: Unfortunately, we do have a problem in Pakistan. But I see Pakistan as the victim more than the perpetrator of violence. Pakistanis are caught in the crossfire of so-called "war on terror" between Al-Qaeda and the West whose seeds were sown in the 1980s at the behest of Uncle Sam. The war is being fought in lands far removed from Washington and London, even though we in the West do get the bitter taste of it on occasion. The largest number of casualties are being inflicted by both sides on innocent civilians rather than direct combatants. I am hopeful that Obama will see it for what it is. And, instead of escalating this unjust war, he will try and wind it down. Military force alone has not worked. What is needed is a political track to resolve it in a way that ends terror for all the parties involved in this endless conflict. May I know why you haven't published my comments? You say, "May I know why you haven't published my comments?" I'm not sure which comment you are referring to. I usually publish almost all of the comments. The only exceptions are when I see someone use exceptionally abusive language that does not contribute to the dialog. Please resubmit and I'll look at it again. You say, "As for the "civility" of Indian students, leave that for others to be judged." You seem to have a very different standard of civil behavior than either the writers of the Stanford Daily Editorial or I, as a reader. Maybe what you find acceptable behavior in your society is fundamentally different from the expectations of others. 1. No sooner had the microphones been turned on did the cat-calls start flying. Enraged Indian nationalists and other emotionally charged students questioned everything from the legitimacy of Musharraf’s rule to the inherent corruption of the Pakistani government. 2. This event is but the most recent manifestation of the problem with enlightened and civil discourse on campus. As one of the leading educational institutions worldwide, Stanford is a repository for diverse opinions, ideologies and global outlooks. One sees Christians in Pakistan doing all kinds of menial jobs. Whether they are domestic cleaners or sweepers, one can safely assume them to be Christian. For reasons that can best be anthropologically described, and unknown to yours truly, they are financially constrained to the lower stratas of society; I certainly don't see them being harassed or ridiculed in the name of religion. But in India, it seems, Hindu fanaticism - especially against Muslims - is a huge problem. Why, after years of co-existence is it so easy to brainwash the Hindu mind? And why is this issue not highlighted as much as the brainwashed jihadi? But then, one can ask why the West doesn't shed a single tear for the killings of thousands of Palestinians in response to 10 Israelis! Hate against Pakistan and minorities is common among upper casts. Behavior of these students is just manifestation of this. They are actually trying to copy behavior of their former colonial masters with added dose of religious bigotry. One of common and quite mainstream joke in India about lower caste communities, minorities and Pakistanis is that they "smell". And of course any slight criticism of India will get these people all riled up. You said - "In today's Indian political spectrum, there is no such thing as "Indian Nationalism". It died with Gandhi and Nehru.." If we assume that is true, are you insinuating that the politically astute Stanford Editorial team is blissfully unaware of the "death" of Indian Nationalism? If we assume that even this were to be true (now the grounds on which your argument stands has started to crumble ominously), who are you to put words in their mouth and loudly trumpet that they meant "Hindu Nationalists"? In your subtle implication that the Stanford editors have an insufficient understanding of the current political scenario in India, you have shot yourself in the foot. But in India, it seems, Hindu fanaticism - especially against Muslims - is a huge problem. In India, Muslims are treated way better than in any country where they form a similar percentage of population. Muslims form a major chunk of the cultural, sports and political spheres of India. True, there are fundamentalist outfits, but these are marginal when compared to the mainstream. About Riaz's allegations that BJP is a Hindu fundamentalist party, I would reply that it is way more secular than Pakistani-"Muslim"-league. An equivalent of the Jamat-e-Islami party (Bajrangdal) doesn't even exist on the political stage in India. You should remember how Mr Ahmedinezad, an acting president of the sovereign state of Iran was treated by the "official" head of the Columbia university in USA. Unlike Musharaff, Ahmedinezad never started a war of aggression against another country or suspended the civilian constitution of his own country. Indian students deserve their freedom of expression, and I seriously doubt if Musharaff deserved any more civility than what was accorded to him at Stanford. He doesn't represent Pakistan (anymore) and whatever treatment is accorded to him has no bearings on the status of Pakistani state.
. But I see Pakistan as the victim more than the perpetrator of violence. I agree, the victims have been Pakistani people. But the culprit has indeed been Pakistani state. All the terrorist outfits (Taliban, Lashkar-e-Toiba, Al-Qaeda) received prime-time backing from the Pakistani state during their inception. Pakistan was the first (and amongst the only 3) countries to recognize the Taliban government after they stormed into power in Kabul. Even today, several Pashtuns suspect that the Pakistani military is aiding the Taliban in their murders. The fact of the matter is fundamentalist Islamists are good for the geopolitical objectives of Pakistan. They have been good for controlling the linguistic seperatist movements and redirecting the people's anger against all things foreign and unIslamic. The question to pose is whether Pakistan is ready to sacrifice these key-allies to the Pakistani state ? And whether Pakistan can emerge as a true sovereign and "secular" democracy ? You quoted me when I said -"As for the "civility" of Indian students, leave that for others to be judged." And in the very next sentence (presumably to oppose this view), you say -"You seem to have a very different standard of civil behavior than either the writers of the Stanford Daily Editorial or I, as a reader. Maybe what you find acceptable behavior in your society....". I'm sorry, but that is merely a tangential rant. I have never attempted to present my view of civility, nor my society's. In fact, that's exactly my point when I say "leave that for others to be judged." You quote me, seem to concur with me, and then merrily scoot off on a tangent, which is essentially a presumptuous prejudgement on my "civility" and my society's, whatever that is. In doing so, the sly and deliberate attempts to distort what the Stanford editorial really said have been stripped wide open. Saadia, thanks for your incisive and profound insights into Indian society, Pakistani Christians, Muslims in India, and the West's response to the killings in Palestine. They truly were eye-openers. Oh, wait! But what was your point again? I hate to break it to you..Pak is an "Islamic" State with a blasphemy law which gives death sentence for blasphemy.The UN banned organization called Jammat-ul-dawa (a front for a terror org LeT) is running 100s of schools,engineering colleges in Pak which has 1500+ offices. Parts of your populated areas are out of control and seized by Taliban to such extent that Americans attacks with UCAVs regularly and being called as "the most dangerous place" or "epicenter of terror" or "international migraine" at different times by different players in the international community. And you are finger wagging at "Hindu extremists" you have seen only on TV. I agree that Pakistan is more a victim in the terrorism wrecking the region, but it really is time that Pakistan as a state tries to rise above that and fight the very same forces that undermines peace in this region. It is sad that the recent Mumbai events has made everyone jingoistic and less focused on how we can collectively fight the terrorists. I for one, do not believe that it is in the best interest of Pakistan to further and foment terrorism in this region or that they are deliberately doing so. Clearly they might be turning a blind eye to certain segments of their country's regulatory bodies. Regarding the state of Muslims in my country ( I am an Indian), yes, we do have a minority Muslim, Parsi, Christian population and yes, we also have sadly enough a fanatic right wing bodies like Bajrang Dal, RSS and VHP. Unfortunately we are as much victims of these organizations as you are with your mullahs and military strategists (to the best of my knowledge this is a fair comparison). The fact that I am a hindu is just one facet of me as a person, and there are many others like I am a working women, a mother, a cosmopolitan person, a bengali- so many different identities and I refuse to be defined by that one identity. The challenge is to fight such elements in both our countries. I like Musharraf - I know this is not very Indian but I know he was a patriot and that he did the best he could for his country. But I can understand that its hard for someone standing on this side of the line to understand the things he does. So you need to be able to see things from both sides. It is really important for us to be able to move beyond the stereotypes. We have such big problems to solve - our poverty and pollution, work ethics- it would be a great pity if we forgot all that and let renegade elements to wreak peace. We need Pakistanis to help us keep peace in our country and vice versa. I can honestly say that Muslims in my country are not treated with disdain - I am sensitive to this myself and I always have gone out of my way to check. I feel its more a case of communities not interacting much. And Saadia when you say Christians are usually economically disadvantaged, I think you are being short sighted. These things happen due to specific reasons. I dont believe there are co-incidences. In India too, muslims and low caste folks are financially disadvantaged and I dont believe its because of historical reasons. Its very important we take them along with us in our growth story. Aurita Jee ke Jai ;-) Jadev Thah..Thah..Thah!!! lol If you recall Riaz started his blogs by appreciating and praising the developments in India and he also talked about 21st century challenges. Like me, Riaz also criticizes all terrorist acts and points out to the root casue. When we refuse to accept, listen, and understand the root cause, we get into an unpleasant exchange. Last Saturday, as he held the India Today Conclave spellbound for over two and a half hours, my mind jumped to our own politicians and I couldn’t help compare Musharraf to them. Would Manmohan Singh and Sonia Gandhi or LK Advani and Prakash Karat willingly submit themselves to such hostile questioning from an Indian audience and emerge both unscathed and with their amour properly intact?